JDC - Archives : Settlers in white suits marching in a parade to thank their new home country. Title Settlers in white suits marching in a parade to thank their new home country. 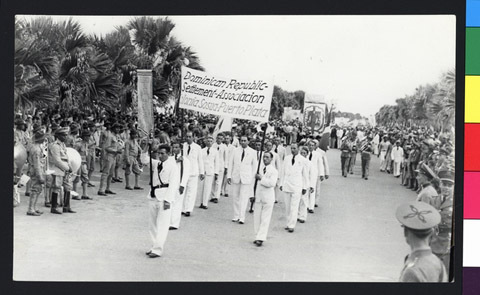 Description Settlers marching in a parade carry a DORSA banner which reads, 'Colonia Sosua - Puerto Plata'. The parade is to thank the people of the Dominican Republic for accepting them into their country.